7" vinyl single still plays well, signs of wear as to be expected. Picture sleeve still in very good condition. 10" x 8" UNSIGNED photograph. International Signed For (Orders over £50) £13.00. International Signed For (Orders over £50) £11.00. 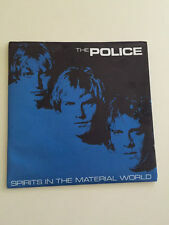 It is titled The Police Special - An Intimate Dossier. It is shown as number 2 from Hot Shot Music Mag. It is not dated but I would say it is from the 1980s. THE POLICE STING / CHELSEA, GREYHOUND, FULHAM 18/09/81. 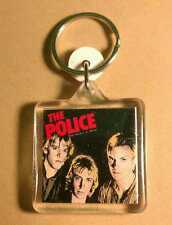 THE POLICE STEWART COPELAND ROCK POP TV SHOW 29/0579. THE POLICE STEWART COPELAND RECORD MIRROR, COVENT GARDEN 18/09/80. 2 of the images were published in the special Police edited issue of Record Mirror! I never got this developed, so sold as seen. A very unusual item. Unopened Guinness bottle - the police memorabilia. Please see photos, the labels on the bottle have signs of age. 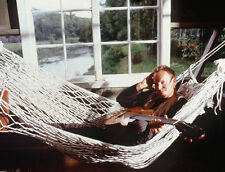 Sting - The Dream of Blue Turtles. The Dream of The Blue Turtles. 12" Pic Disc. Nearly Mint Condition. We Work The Black Seam. Love Is The Seventh Wave. Shadows In The Rain. Children's Crusade. THE POLICE GREYHOUND FULHAM, LONDON 03/07/77. The front pickup had been replaced with a PAF humbucker and the bridge pickup remounted in the body rather than on the broken brass bridge plate. The bridge pieces had been replaced with brass and tuners replaced with Schaller machine heads. A Platinum Single Presentation Disc. 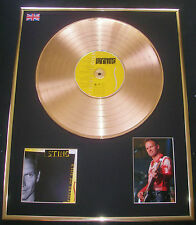 producing Gold, Silver and Platinum Disc Presentation Awards. PLATINUM SINGLE DISC. Suppliers of Bespoke Presentation Awards. With the genuine Vinyl Single. With an engraved polished silver bevelled edged plaque. 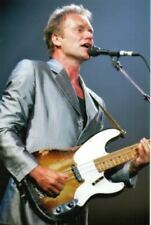 Sting’s 1957 Fender Precision Bass. It still has a growl that a modern bass guitar doesn’t possess. Paper thin, soft raglan Police shirt, rare and hard to find! Small tear near armpit-easy fix. Measures: 19.5” pit to pit, 26” top of shoulder seam to end of shirt. CD / PLATINUM LP PRESENTATION DISC. producing Gold, Silver and Platinum Disc Presentation Awards. The genuine CD is centered on a Platinum LP. Your Favourite CD made into CD/PLATINUM LP. with the CD Booklet and an engraved plaque professionally mounted. First (and only) edition of this pictorial bottle-shaped book which puts the words of Sting's song into pictures. Published by Virgin in 1981. In excellent condition, just a couple of light scratches to the covers. Signed in my presence. Authenticated by Beckett/BAS #E21368. 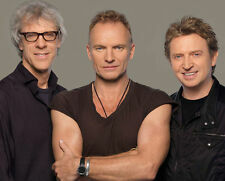 THE POLICE. 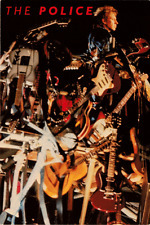 all carefully CUT OUT from Magazines such as Record Collector, Q etc.mainly from the 00s. BIG 11X17 FRAMED POLICE "SYNCHRONICITY" LP ALBUM CD PROMO AD + free chart, too! HERE'S AN ORIGINAL 11" x 14.5"magazine ad page for the classic LP. the Billboard 1983 year-end singles chart showing "Every Breath You Take" as the. Here's a great collectible for all the old-school fans out there. The logo is in a pink glittery thread. If you win more than one item and we can send them together, we will combine them so. A&M Stereo 45 RPM Special Limited Edition in Excellent condition. 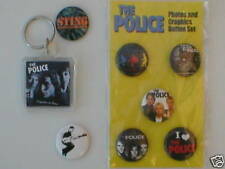 8 VINTAGE ORIGINAL THE POLICE STING MEMORABILIA PIN BADGES 80's. Condition is Good. Dispatched with Royal Mail 2nd Class. Length of sleeve from collar to sleeve hem: sleeveless. I did not launder them. You should launder before wearing. Look at the photos carefully. holes: I didn't see any. Seems many are not finding the choices. The police mirror. Excellent shape. Will be packed and shipped securely. Feel free to ask any questions. Commonly referred to as Condition A or Very Fine. Item may be in "never-used" condition or may have been used in the theater, but was carefully preserved after use. If a C9 is almost like new, then a C8 is not far behind a C9. HERE'S THREE ORIGINAL 11" x 14.5"magazine ad pages for the classic LP. Here's a great collectible for all the old-school fans out there. 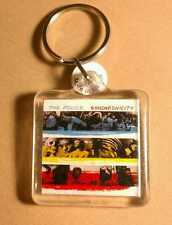 GREAT GIFT FOR THE HARD-CORE FAN THAT HAS EVERYTHING! A FUN, HISTORICAL SET THAT WOULD LOOK GREAT ON YOUR WALL! The POLICE Hollywood Park 1983 CONCERT POSTER Berlin FIXX Thompson Twins MINTY! 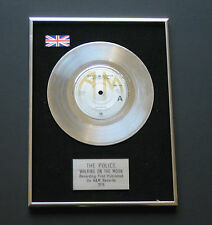 The Police - Original Pass - Madison Square Gardens 2007 - Unused Stock ! Original Concert Tour Program. Original owner. Rare program. Program is fully intact. Well kept in a closed case. Authentic original.